This was published in 2003, and shines a light on the unchanged and discriminating ways and reasons of "validating" (= finding reasons for locking people up in solitary confunement without any end in sight) prisoners on the basis of political ideologies. See also this recent article on SolitaryWatch about the "validation-process"
Heshima wrote that this article was used as a pretext to keep him slammed in the solitary confinement torture unit. 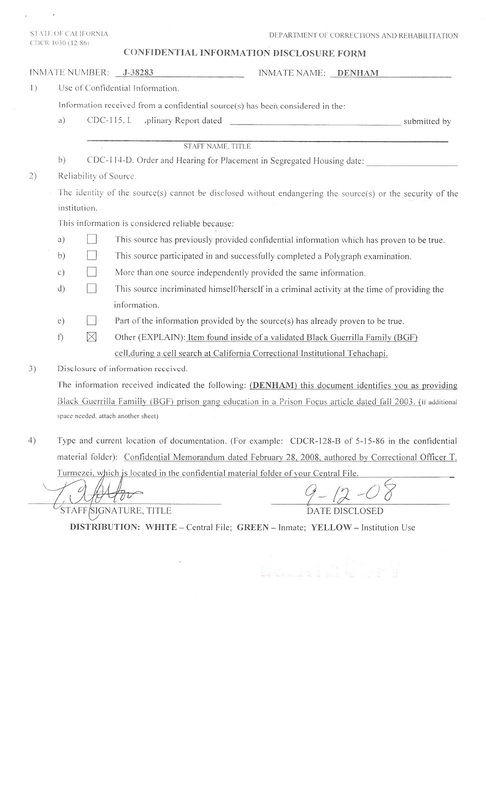 He asked the webmaster to post the attached "Confidential Information Disclosure Form" that shows the prison took this 2003 article published in California Prison Focus as 'evidence' of 'gang activity,' precisely what the article was refuting. In the confines of the concentration camps which make up California's Department of Corrections, those prisoners who express through word or deed any political belief or ideological standpoint divergent from what prison administrators deem the "norm" are labeled clear and present dangers to the general prison population and treated as such, despite the constitutional and regulatory safeguards against political persecution that the CDoC, as an agency of the state, claims to uphold. This pattern of hypocrisy and persecution is responsible for the single largest population of purely political prisoners in the U.S.A., in the form of "validated" Afrikan prisoners in the state of California. "…employees will not subject other persons to any form of discrimination because of race, religion, nationality … political belief…". The Constitution of the United States of Amerikkka, arguably one of the most perfectly written "theoretical" documents on socio-political freedom, ensures in the most elegant terms the right of every citizen, free or bond, to exercise whatever political belief he or she so wishes. This memorandum clearly outlines subject's affiliation with terrorist organizations (i.e. The New Afrikan Peoples Organization and the Afrikan Socialist Party) and support of a New Afrikan Revolutionary Nationalism (N.A.R.N.). N.A.R.N. is considered synonymous with the Black Guerilla Family 'prison gang' and is now accepted as a source for validation purposes." "Some correspondence connects subject with individuals linked to the Weather Underground and the Nation of Islam. These two terrorist organizations are well noted for their sympathies to overthrow the government." I'm sure the hundreds of thousands of Afrikans in Amerikkka and abroad who subscribe to the political ideology of New Afrikan Revolutionary Nationalism, Maoism-Leninism-Marxism, and Scientific Socialism, as well as the millions of Muslims who adhere to the religious doctrine of the Nation of Islam will and do take offense to L.L. Anderson, and the CDoC relegating their beliefs and faith to "prison gangs" and "terrorist groups", not to mention the total disregard for their own regulations and the guarantees set forth in the Constitution of the United States of Amerikkka. I myself was validated as a member of the so-called "Prison Gang/Terrorist Group", the Black Guerilla Family at High Desert State Prison in August of 2001 in perhaps one of the most ridiculous examples of fabrication of evidence and misrepresentation of facts in the history of the validation process. 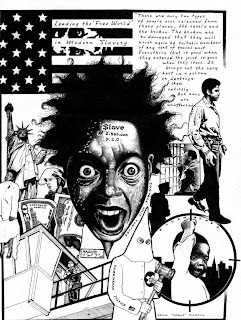 "…New Afrikan Revolutionary Nationalism is considered synonymous now with … prison gang(s)…". It is my contention that the reality of political freedom and the right to exercise such does not extend to those whose freedom has been abrogated by the legal farces men call "courts of law". Despite the obvious hypocrisy of the CDoC and its insistence on persecuting New Afrikan Revolutionary Nationalists, I'm not naïve enough to react emotionally to this phenomena, quite the contrary, I approach virtually everything with cold objectivity and analytical emotional detachment and therefore can understand intellectually why the state fears us so. As an ideological system, New Afrikan Revolutionary Nationalist and Scientific Socialism is in diametric opposition to the actual "penological interests" of the CDoC which is the genocide of Afrikan and Latino males in this state. 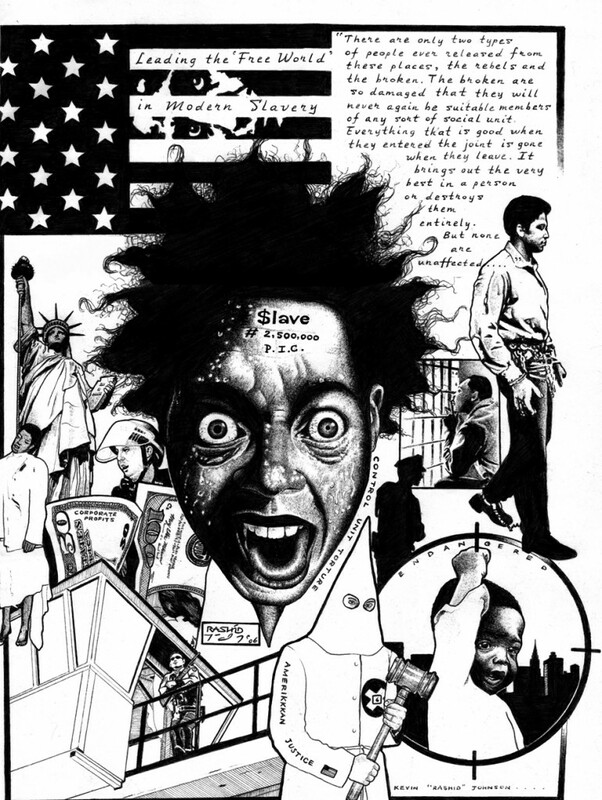 In order to justify the existence and prevalence of the prison industrial complex as a societal necessity here in California, the state must relegate the proponents of Nationalism/ Socialism/ Egalitarianism within the concentration camp environment to the status of "criminal", "terrorist", or "gang member" in order to neutralize the organizing and psychological liberating effect the proponents of such have on the masses of otherwise uninitiated prisoners who find themselves, more often that not, in the clutches of the Department due primarily to the socio-economic disenfranchisement, behavioral modification, and educational/employment disparities based on race which are systemic built-in mechanisms for the Amerikkkan social infrastructure. The entire so-called criminal justice system and the prison-industrial complex it serves, is not a solution to the ills of society and I challenge any objective analyst to state its aims are "justice". This entire machine is nothing more than a mechanism to "legitimately" exterminate a specific portion of this Nation's population, particularly Afrikans and Aztecs, but first creating the social conditions which offer no other viable choice to meet the basic needs save the transgression of countless laws, then ensure the conviction and lengthy incarceration of those who do transgress, ending in the doom of the strongest aspects of the non-white male population, and all in the name of the law. This is something the current system of power is not prepared to do. One must concede, from a purely intellectual and objective point of view, were I a "Babylonian", I would do whatever necessary to maintain my position of power as well, including crushing the rights of my incarcerated citizens and throwing those who would expose me for the charlatan and fascist that I am in the deepest, darkest, dankest cell I could find. You must above all love the people, and do all of this while attempting to conceal what you are in plain sight of an enemy who would love nothing more than to throw you in a SHU cell for the rest of your life. George Lester Jackson stated in his sage masterwork, Blood in My Eye, that "…revolution is a war for the minds of the masses", and it is my contention that the only thing that separates the makers of history for those whose histories are made for them, is the power to alter their environments, the power of change. That power, ladies and gentlemen, is nothing more or less the power of information. Revolutionaries educate the masses, but it is virtually impossible to do so in the concentration camp environment, while living according to the ethical and behavioral precepts you are espousing, and not eventually be compromised. 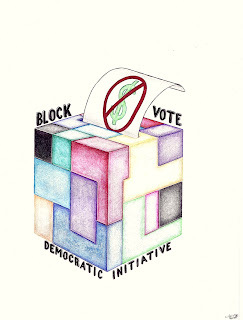 No matter how progressive the results engendered by revolutionary agent in any particular prison sector, for or against prison administrators; no matter how righteous the aims or outcome of such activism-it will be deemed a threat, and the proponents of change will be attacked and relegated to the harshest, most isolated conditions these "people" can concoct. This is merely the reality of the situation, and must be addressed as such. The political (and all too often actual) survival of revolutionary activists within the concentration camp environment depends solely on one’s ability to remain clandestine. The CDoC's hypocrisy, and the states support thereof, should be viewed by all revolutionary activists and proponents of human rights, as verification of the righteousness of our cause and should serve as a motivational factor for true commitment. Nonetheless, in the final analysis no level of persecution or obvious hypocrisy will alter the truth, and the truth of the matter is those who prescribe to such political beliefs as New Afrikan Revolutionary Nationalism, are not members of a "prison gang", nor are they "terrorists", they are fearless men and/or women who call the oppressor an oppressor, and are prepared to do whatever is necessary, including enduring persecution, to alter that reality. I state, without apology, that if we apply the CDoC's description, the BGF are not a "prison gang" or "terrorist group", these brothers are a revolutionary organization no different, or less legitimate than the Afrikan Peoples' Socialist Party, the New Afrikan Peoples' Organization, of the Revolutionary Communist Party, and I'm sure they, like all other progressive organizations do not see the future of the world through the prism of Amerikkkan geopolitical interests, and thus by the CDoC's definition, are a threat to those interests. Yet under the rubric of Amerikkkan psychology, Israel, a state that bombed Palestinians out of their homes to create this nation-state after W.W.II is an ally-Nation, and the Palestinian people who resist with force the apartheid-like conditions, they are forced to live under are "terrorists" and “extremist". In fact, any organization, group, state, or nation opposed to Amerikkka and its interests are labeled "criminals", "gangs" or "terrorists". Namibian foreign minister Theo-Ben Gurirab, a leading office of the Afrikan Union, while at a recent summit of the Commonwealth Heads of Government in Coolum, Australia stated: "We think the…definition of terrorism is built only around enemies of the U.S…." [see: http://www.csmonitor.com/2002/0320/p09s01-woaf.html], and I must not only agree, but raise my fist in solidarity with every other Afrikan prisoner "validated", and serving and indeterminate SHU term in the state of California in declaring to the world-we are living examples of this reality; that even in the confines of prison, we are hunted down, rounded up, and buried under the penitentiary.